Mystic Seaport has embarked on a major project to transform the north end of the Museum to greatly enhance the quality of exhibition space and offer a more robust year-round experience for visitors. The project is an important initiative as Mystic Seaport seeks to continue its leadership in the maritime heritage field. This project is the result of a strategic planning process that began in the early 2000s. After a decade of careful analysis and consultation with leading professionals, it was clear that future success required a substantial investment in the expansion and improvement of the Museum’s exhibition capacity. An additional need was to improve the all-season opportunity for our visitors and to embrace contemporary channels for them to explore our nation’s maritime history. The project is a $15.3 million commitment to achieve those goals with the combination of new construction and significant upgrades to existing buildings and spaces. The distinctive McGraw Gallery Quadrangle, which was completed in July 2015, meshes existing buildings and grounds with new architectural achievements. 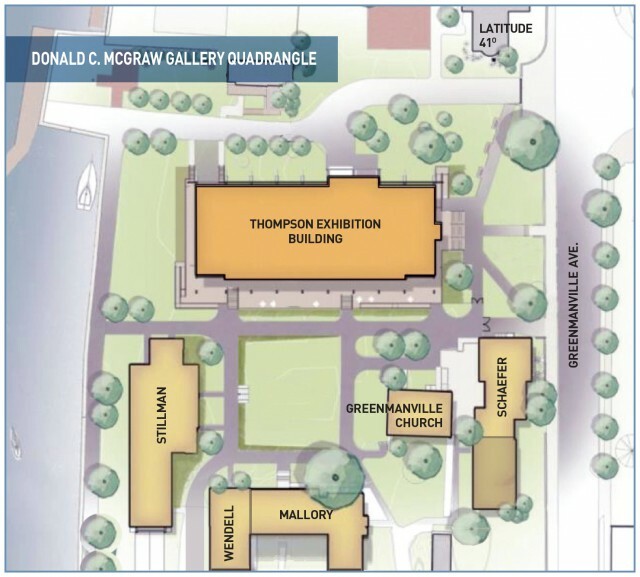 Named for the late Donald C. McGraw, Jr., a longtime Mystic Seaport supporter and passionate advocate for the collection and preservation of maritime artifacts, the Quadrangle seeks to unify the components of the north end of the Museum by focusing on their common role as formal exhibition galleries. The Quadrangle’s cornerstone, the new Thompson Exhibition Building, houses exemplary exhibition facilities using the latest technologies and flexible space to engage with visitors and serve their diverse interests. Along with new construction, the existing Stillman Building and R.J. Schaefer Building have undergone significant renovation and improvements to expand their exhibition capacity and complement other investments made in recent years to the Henry B. duPont Preservation Shipyard, Collections Research Center, Williams College-Mystic Seaport academic buildings, and to the watercraft collection. Mystic Seaport opened the contemporary Thompson Exhibition Building in September 2016. Named for the late trustee, Wade Thompson, and designed by the renowned Connecticut firm Centerbrook Architects and Planners, the 14,000 square-foot facility includes an outstanding exhibition space, the Collins Gallery, which is the crown jewel among the Museum’s seven such galleries. This flexible, 5,000 square-foot hall features soaring ceilings and an unobstructed floor plan to accommodate objects of varying size and installations of all types, from watercraft to priceless works of fine art. The Masin Conference Room graces the west side of the building. The room can be reconfigured for meeting, additional gallery space, or educational programs, adding to the new building’s versatility. On one wall is a panoramic window looking out over the Mystic River; on the other is a mural-sized enlargement of a photograph of Greenmanville Ave. (the site of present-day Mystic Seaport) in 1874. The Thompson Exhibition Building incorporates a wraparound deck that allows visitors to enjoy the riverside setting and serve as a covered overlook to the Quadrangle lawn. Other components include a prominent Museum entrance, the Pilalas Family Reception Lobby, a ticketing center, a retails shop, and visitor amenities. Mystic Seaport has already set out to create new exhibits to reflect the level of quality, innovation, and scholarship appropriate to the Museum’s new venue. “Voyaging in the Wake of the Whalers,” which opened in June 2015 in the upgraded first floor of the Stillman Building, is developed from the scholarship, partnerships, and accomplishments of the Charles W. Morgan’s return to sea in 2014. The expansive exhibition combines Museum artifacts, artwork, audiovisual elements, and interactive displays to facilitate an understanding of the forces that initially drove the whaling industry, humankind’s changing perceptions of whales, and the latest research into whale-human interactions. It also explores modern tensions among environmental issues, economic and industrial needs, cultural practices, and inter-species relationships. The Benjamin F. Packard Cabin has been relocated to the second floor of the Stillman Building. Its previous location, a former mill outbuilding, had to be demolished to make way for the Thompson Exhibition Building. The new, larger space will afford additional artifacts and displays to place the cabin in the context of the important coasting trade in which the Packard participated. The Cruising Club of America Reading Room and exhibit, “Adventurous Use of the Sea,” formerly in the G.W. Blunt White Building which was razed as part of the new construction, has been moved to the third floor of the Stillman Building. Now named the CCA Olin J. Stephens II Reading Room, the exhibit is hosted in conjunction with a digital exhibit. “Ships, Clocks & Stars: The Quest for Longitude”, a traveling exhibit from the United Kingdom’s National Maritime Museum in London was on display in the R.J. Schaefer Building from September 2015 to March 2016. The exhibit recounted humankind’s epic effort to solve the riddle of determining longitude. The exhibit featured more than 100 remarkable artifacts, art objects, and working replicas of the original John Harrison clocks. Mystic Seaport was just one of three museums worldwide selected to host the exhibit outside the United Kingdom. The R. J. Schaefer Building received significant upgrades to support this important exhibition. “Over Life’s Waters: The Coastal Art Collection of Charles and Irene Hamm“ opened in the R.J. Schaefer Building in May 2016. The exhibition, on loan from The New Britain Museum of American Art, consisted of 63 works of art in a variety of media, spanning two centuries of American coastal art and featuring such noted artists as William Partridge Burpee (1846-1940), Sears Gallagher (1869-1955), Rockwell Kent (1882-1971), and Paul Pollaro (b. 1921).The exhibit ran through January 16, 2017. The first exhibit to be featured in the Thompson Building’s Collins Gallery is SeaChange, a dramatic presentation of a range of unique objects drawn from the collections of Mystic Seaport. The artifacts are presented in a new setting that reveals surprising stories of transformation that continue to impact a contemporary audience and its experience with the sea. The exhibit opened December 10 and will run into fall 2017. The exhibits are just the beginning. The Thompson Exhibition Building and the McGraw Gallery Quadrangle will set the stage for a new era of exhibitions at Mystic Seaport, insuring that future generations will have the opportunity to engage with America’s story of the sea.